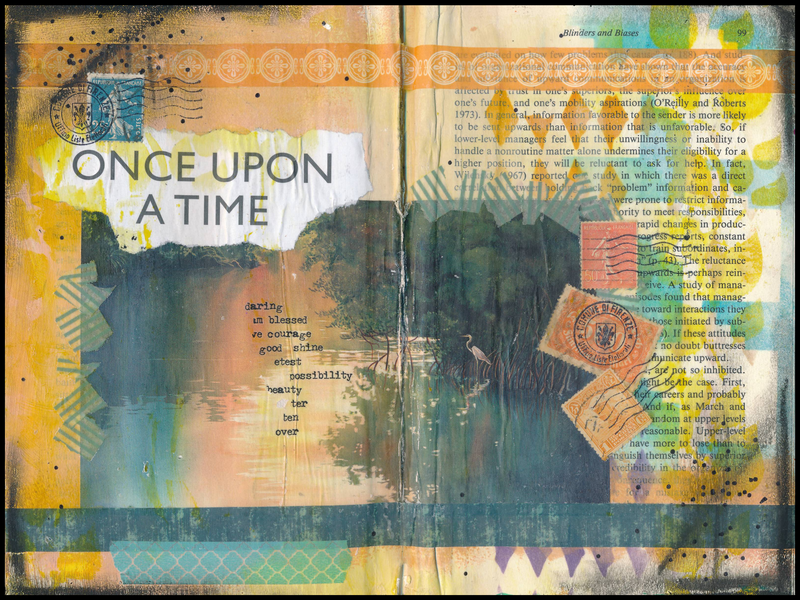 “Once Upon a Time” — that’s how every good story begins! I made this art journal page by rubbing orange and yellow Distress inks through several stencils (right side of the page), and some smeared acrylic paints on the left side. I collaged a found image on the left side with a phrase torn from a magazine. I used bits of torn washi tape and real postage stamps to soften the edges of the image. I applied several strips of washi tape to top and bottom, edged the corners with black pastels, and added a few black dots with a sharpie. I used rub-on words on top of the image, and rubber stamped cancellation marks onto the postage stamps. How does your story begin?